Evansville man arrested for driving without ever receiving a license. On November 10, 2018, at 2:11 a.m. Deputy Austin Farrington conducted a traffic stop on a Tan 2002 Buick Regal on US 41 near CR 1250 South. Upon approaching the vehicle Deputy Farrington identified the driver as 42 year old Christopher Lewis of Evansville. During a roadside investigation Deputy Farrington ran Mr. Lewis through the Indiana Bureau of Motor Vehicles and discovered that Mr. Lewis had never been issued a valid operator’s license. At that point Mr. Lewis was taken into custody and transported to the Gibson County Jail. 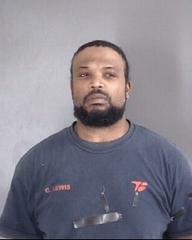 Upon arriving at the Jail Mr. Lewis was charged with Operating Without Ever Receiving a Valid License. He remains in custody on a $450 bond.